Last Week in Review: February New Home Sales reached their best level in seven years, while U.S. economic growth for 2014 was disappointing. 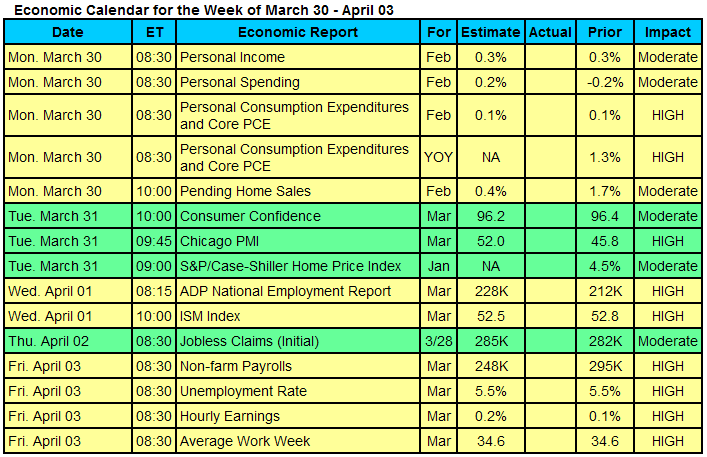 Forecast for the Week: A packed economic calendar is ahead, culminating with Friday’s Jobs Report for March. View: Use these tips to help avoid flight delays, or make any delays you do experience more palatable. “You take the good, you take the bad.” The Facts of Life. That television series theme song also applies to recent economic news, as housing is a bright spot while economic growth overall remains sluggish. New Home Sales surged in February, rising 8 percent from January to an annual rate of 539,000 units, while January’s sales were revised higher to 500,000. 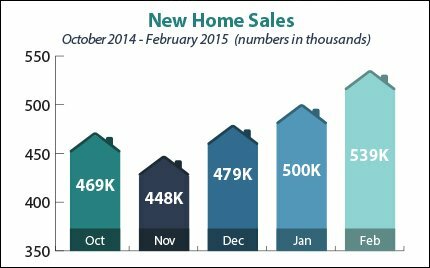 New Home Sales now stand at their best level since February 2008 and are up nearly 25 percent from the 432,000 recorded in February 2014. The report also showed that the median sales price for new homes was $275,500, up 2.6 percent from a year ago. 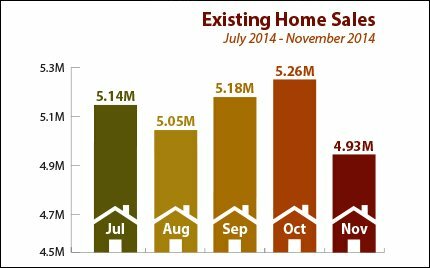 Existing Home Sales also rose by a modest 1.2 percent in February, to an annual rate of 4.88 million units, which was just below expectations. 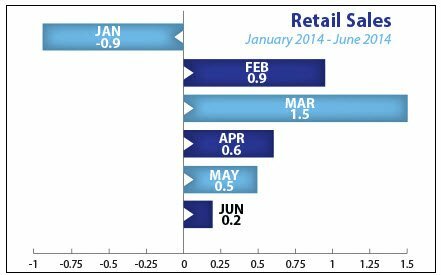 Low inventories were said to be a key factor in price growth, which rose at the fastest pace in a year. However, growth for our economy overall is still sluggish. The final reading on fourth quarter 2014 Gross Domestic Product (GDP) was unchanged from the second reading, coming in at 2.2 percent. 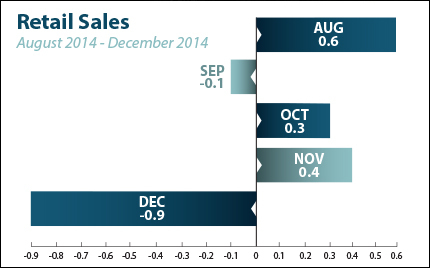 This was well below the 5 percent recorded in the third quarter of last year. For all of 2014, GDP was 2.42 percent, which is disappointing considering we are six years into our economic recovery. One positive item to note from the report: Consumer spending rose to 4.4 percent, which is the fastest rate since the first quarter of 2006. 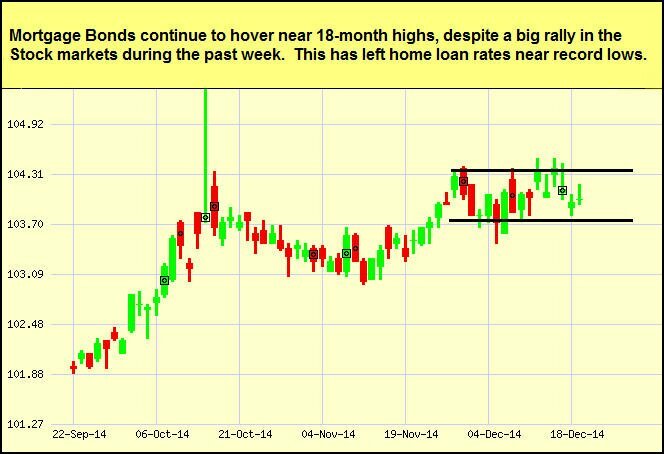 The bottom line is that home loan rates remain attractive, and now is a great time to consider a home purchase or refinance. Let me know if I can answer any questions at all for you or your clients. Key reports on inflation, manufacturing and housing are ahead, along with the Jobs Report for March. 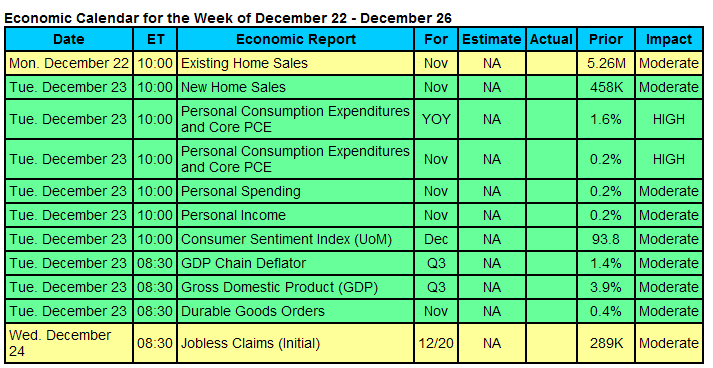 The packed economic calendar will kick off on Monday with the Fed’s favorite measure of inflation, Personal Consumption Expenditures, along with Personal Income and Personal Spending. In housing news, Pending Home Sales will be released Monday, followed by the S&P/Case-Shiller Home Price Index on Tuesday. 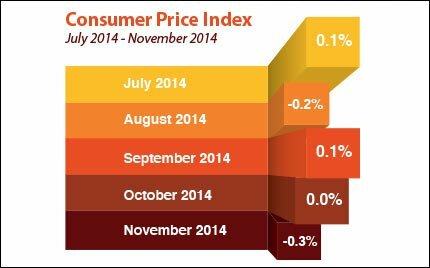 Also on Tuesday, we’ll get a read on Consumer Confidence. In the manufacturing sector, look for the Chicago PMI on Tuesday and the ISM Index on Wednesday. The first of two key labor market reports will be delivered on Wednesday with the ADP National Employment Report. As usual, Weekly Initial Jobless Claims will be released on Thursday. 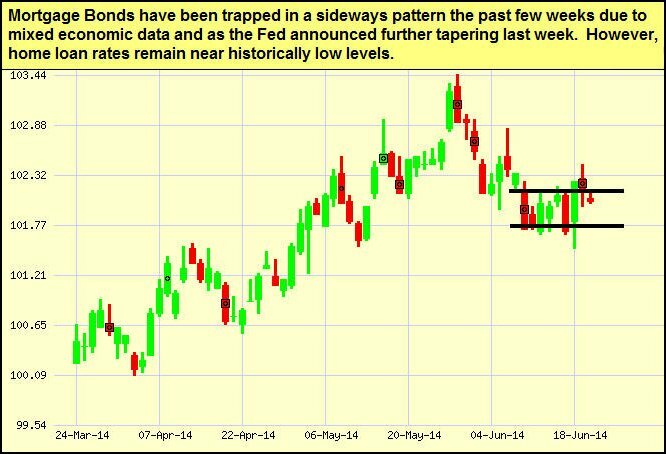 That brings us to Friday’s Jobs Report for March, which will be dissected to the fullest extent by investors around the globe. The Jobs Report includes Non-farm Payrolls, the Unemployment Rate and Hourly Earnings. To go one step furtherâ€”a red “candle” means that MBS worsened during the day, while a green “candle” means MBS improved during the day. Depending on how dramatic the changes were on any given day, this can cause rate changes throughout the day, as well as on the rate sheets we start with each morning. 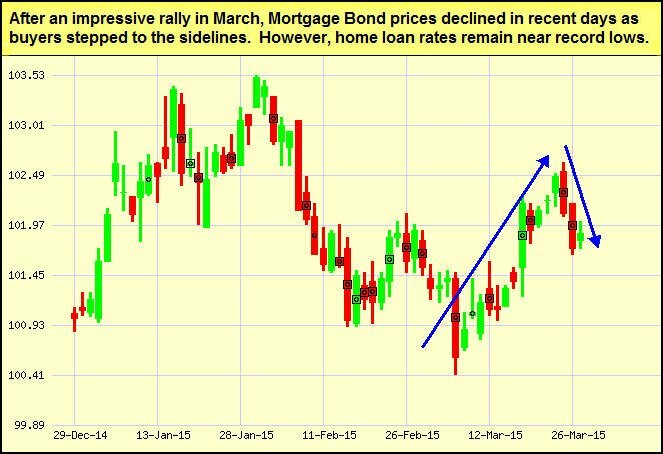 As you can see in the chart below, Mortgage Bonds worsened in recent days after rallying earlier this month. 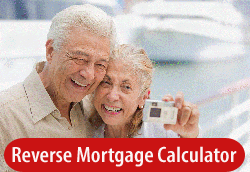 However, home loan rates remain near record lows. Help! My Flight is Delayed! Earlier this year, a Texas to Oklahoma flight scheduled to last 58 minutes turned into a 9-hour nightmare as the plane was delayed due to bad weather. While avoiding flight delays entirely may be impossible, there are some steps you can take before, during and after experiencing one. Before you fly. Technology and big data to the rescue! FiveThirtyEight has analyzed 6 million flights and discovered which airports, airlines and routes are most likely to arrive on time. Check out your upcoming or future flights here. Know your rights. Take a minute to review the specific details of your airline’s customer service plan (here are links for Delta, United, JetBlue and American Airlines). If your airline fails to meet its commitments, you can submit a complaint to the U.S. Department of Transportation’s Aviation Consumer Protection Division. If you get stranded. Visit the FlyersRights.org Help! I’m Stranded page for a list of helpful information, including airline phone numbers. If you can take a different flight, the Next Flight app lets you check for non-stop flights for the current day and following two days. In case you’re stuck, Priority Pass gives details on 700 airport VIP lounges, before you shell out membership fees. Feel free to pass these helpful tips along to your team, clients and colleagues.